Roasted potatoes are not uncommon at the dinner table. But the ease of adding a mixture of root vegetables in the roasting pan is not only more colorful, but more delicious and nutritious! 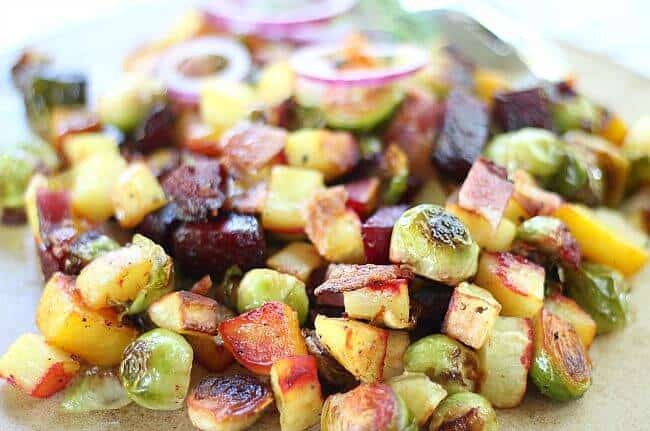 This combination of beets, sweet potatoes, and brussels sprouts is super quick from the cutting board to the oven. 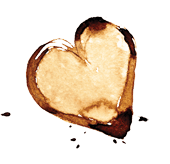 Roasted in olive oil, then mixed with crispy bacon and drizzled with a touch of balsamic vinegar. What a great variety of texture and flavor! Many excellent cooks confuse sweet potatoes and yams as being the same thing but they are very different in cooked texture and appearance. For this recipe, you want the lighter sweet potatoes which hold up better when roasted. And since they take a bit longer to cook than the rest of the vegetables, throw the potatoes in the microwave for just two minutes to give them a bit of a head start. During the roasting process, the outer leaves of the sprouts may start to get REALLY dark and charred looking. Don’t worry, they will be fine and delicious. Just toss the mixture half way through cooking. Adding the bacon is optional and can be left out for vegan and vegetarian tastes, or serve the bacon separately and even substitute pancetta. 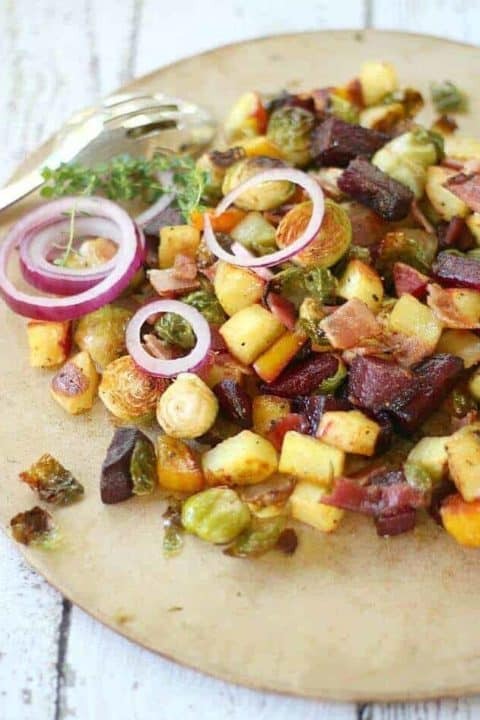 This combo of roasted root vegetables with brussels sprouts and bacon is perfectly charred and is a great grilled meat partner. But it also transitions into fall and winter weather as a nice complement to roast beef. Cook the sweet potatoes for a minute or two in the microwave before adding to the other vegetables for roasting to ensure even tenderness of all vegetables. <span></span>Preheat oven to 400F degrees. Place oven rack one place above the middle. 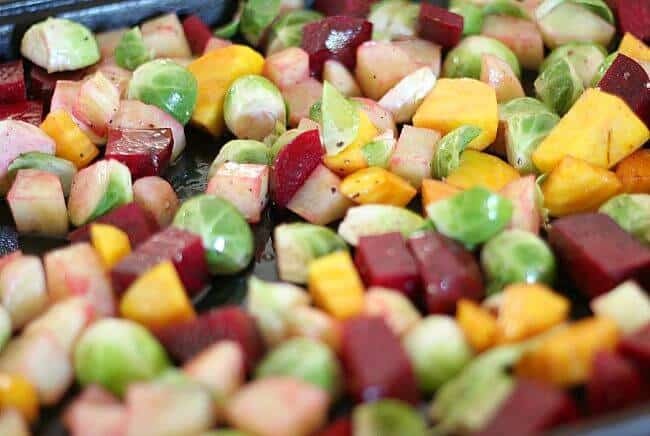 In a large bowl, toss the sweet potato, beets, and brussels sprouts in the oil. Spread vegetables on rimmed baking sheet. Sprinkle with salt and pepper. Roast until tender and brown on edges, about 30 to 40 minutes, stirring one time about half way through cooking. The outer or loose leaves from the sprouts might get very crispy. This is okay. Remove from oven and transfer to serving bowl. Crumble or roughly chop bacon and sprinkle over the vegetables. Drizzle with just a little balsamic vinegar (or even hot sauce) before serving. Add a light splash of extra olive oil too, if desired. Adapted from Prevention Magazine recipes. LOVE me some roasted veggies, too! I have a similar version and the possibilities are endless, right? Am I correct in that the baking stone is from Pampered Chef? I have one myself. Stoneware is THE best and so easy to clean up… like this dish of roasted veggies bacon. It would be gone pretty quick around our house for dinner.